If you thought wireless interference among unlicensed wireless Ethernet bridge systems is bad now, just wait. What's going to cause this flood of wireless interference is the introduction of 802.11n based, OFDM and MIMO, outdoor wireless backhaul systems. Add to the mix the amount of wireless backhaul being deployed in the IP video surveillance industry. Microwave communication using unlicensed wireless Ethernet bridge systems have been an extremely popular choice for outdoor wireless backhaul. Many Point to point wireless backhaul, point to multipoint wireless Ethernet bridges, wireless mesh, and outdoor Wi-Fi systems use unlicensed wireless spectrum. The unlicensed spectrum of 5GHz (5.3GHz, 5.4GHz, and 5.8GHz UNII bands) became a primary selection by many end users and outdoor wireless installation VAR's, because of their flexibility, cost effectiveness, rapid ROI, and quick deployments. Unlike a licensed microwave link, which can take several weeks to acquire a license, purchase and install, an unlicensed point to point wireless Ethernet bridge can be purchased and installed literally in a day or two. Point to multipoint wireless backhaul and wireless mesh networks are primarily in the unlicensed 5GHz. Note: with a few exceptions of the 4.9GHz public safety band and now with the 3.65GHz WiMax backhaul spectrum. Many outdoor wireless manufactures started introducing "value line" point to point wireless Ethernet bridges using 802.11 chipsets. Basically, the same radio boards found in Wi-Fi access points put into an outdoor enclosure and using outdoor wireless antennas. The point to multipoint wireless bridge and wireless mesh backhaul systems all use the same 802.11 architecture. Some manufacture has changed the protocols to 802.16 standards or use a proprietary protocol, but they are all Atheros based (or equivalent) chipsets under the hood. The value in these chipsets is the cost of deploying an outdoor wireless backhaul has come way down. The problem of these systems being so cheap is that many end users (non-trained outdoor wireless professionals) have started to deploy their own outdoor wireless bridges. 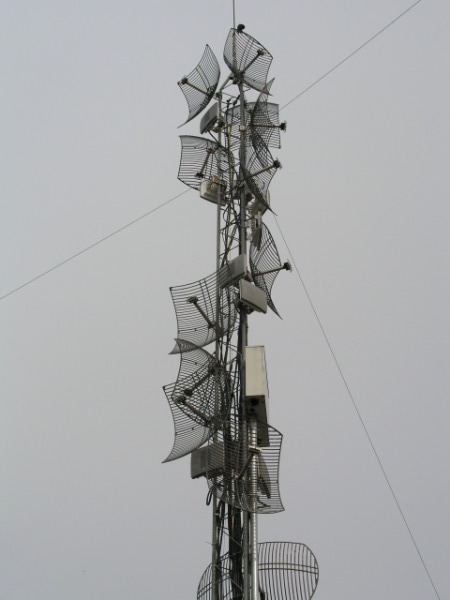 Back in the day the wireless installation of Enterprise grade unlicensed wireless backhaul radios was done by outdoor wireless professionals that knew how to use the right antennas, power settings, and methods to help avoid wireless interference on their clients' wireless bridge as well as other wireless backhaul users in the area. Many of the low cost wireless bridge radios come with integrated wide beam antennas (7 to 11 degree beam width on panel antennas, 30-60-90 degree beam width on sector antennas, and 360 degree omni-directional antennas) and have default power output settings set to max (which most forget to turn down where not needed). So what's the issue? In my article "Wireless Interference - The Effect on Unlicensed Wireless Backhaul" we discussed how wireless interference on unlicensed wireless Ethernet bridge systems has continued to grow. The new 802.11n based wireless backhaul radios use OFDM and MIMO taking advantage of multipath, especially helpful in nlos (non line of sight) applications. They also produce a lot of multipath! They also need to use a wider channel width to obtain a higher data rate, up to 40MHz wide. Because these systems, according to manufacture specifications and marketing, can produce high aggregate throughput at an attractive price many people that didn't use outdoor wireless bridge systems are now starting to. As more and more people get tempted with the thought of 100Mbps, up to 300Mbps providing an extremely fast ROI compared to a leased telco line, more and more unlicensed wireless backhaul will be deployed. The one thing that that people don't understand is that to get the full throughput the system must run at full modulation and channel width with limited wireless interference. This is something that the manufactures forget to mention. Because people are not controlling their RF signals by deploying so called plug and play outdoor wireless bridge systems and using wide beam antennas at full transmit power the amount of interference is going to explode. Add into the mix the amount of wireless backhaul for video surveillance. Wireless video backhaul is a huge topic and growing industry. Each year at the popular industry trade event, CTIA, there is a growing number of manufactures displaying their unlicensed wireless video backhaul systems. Using wireless backhaul for video is a great application. But with the large number of unlicensed wireless Ethernet bridges being deployed and the amount that is done improperly the amount of wireless interference is bound to grow. Should you consider an unlicensed wireless Ethernet bridge, using OFDM and MIMO? These types of outdoor wireless Ethernet bridges provide a great inexpensive solution. They work extremely well on challenging near-line-of-sight and non-line-of-sight applications. They also provide a great amount of throughput at a great price. If you need a true enterprise point to point wireless bridge and have line-of-sight (LOS) there is no substitution to a licensed microwave link, see "Licensed Microwave Wireless Backhaul." The one thing to keep in mind is prior to considering an unlicensed wireless Ethernet bridge for microwave communication a wireless site survey, spectrum analysis, and a proper wireless path calculations should be performed. As with any point to point wireless backhaul, point to multipoint, or wireless mesh system a certified expert should perform the wireless installation.